Nippon Telegraph and Telephone (NTT) and six partners have established a new world record of 118.5Tb/s for the largest transmission capacity achieved over an optical fibre of standard dimensions. Though the optical fibre had the same diameter as standard singlemode fibre, its structure was not standard. The design contained four cores (light paths) running along the fibre’s length. In addition, the partners built a long-haul transmission system mixing multi-core optical fibre and amplifiers from different manufacturers – and showed that it had losses comparable to a standard optical transmission system. The demonstration is intended to show that multi-core fibre could be commercialised much sooner than previously thought. “We will aim to introduce the standard diameter multi-core fibre by the early 2020s,” said NTT via a press release. “This achievement proves the concept of multi-core fibre based long-haul and large capacity transmission system consisting of multiple vendor technologies, and it makes significant progress on practical use of the multi-core fibre technology,” the partners declared. This remarkable achievement was reported on 4 August as a post-deadline paper – a late-breaking result that’s considered particularly significant – at OECC 2017 in Singapore. The other partners in the work were KDDI Research, Sumitomo Electric, Fujikura, Furukawa Electric, NEC, and Chiba Institute of Technology. Multi-core fibre is being investigated intensively all over the world to overcome the looming ‘capacity crunch’ as it becomes increasingly difficult to cram more data down a single optical fibre (see our feature article Breaking the glass ceiling). This latest work is not the largest capacity ever reported for multi-core fibre, however. 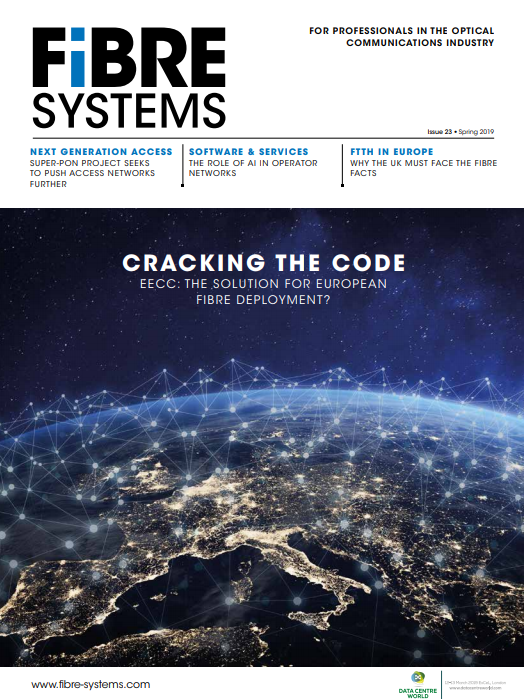 Petabit capacities have been reported in experiments using fibre with 10 or more cores (see, for example, ECOC 2015: Researchers claim 2.15Pb/s fibre capacity record). High-core-count multi-core fibre usually needs a thicker glass diameter, which is more demanding to manufacture and will require additional work to develop compatible sub-components. As a result, it is considered that it will take a decade or more to make the technology ready for adoption. To accelerate the use of multi-core fibre technology, the Japanese partners proposed and developed a multi-core fibre design with the same physical dimensions and mode field diameter (the ‘spot size’ of light in the core) as standard singlemode fibre. This should make it possible to use existing optical fibre fabrication techniques and connector technologies; however, it limits the number of cores. The problem with higher core counts is that signals start to interfere when neighbouring cores are placed closer together, which leads to loss of signal quality. NTT and KDDI Research determined that it would be possible to include four or five cores inside a 125µm-diameter cladding without significant interference between neighbouring cores. (It is interesting to note that Sumitomo previously developed an eight-core fibre with 125µm diameter, but this was aimed at datacom applications based on shorter wavelengths and distances – see Sumitomo designs 8-core fibre for compact optical cables). Based on these design guidelines, Sumitomo Electric, Fujikura, and Furukawa individually fabricated multi-core fibres with four cores in lengths of more than 100km. The multi-core fibres were then divided into pieces 20–40km long, and three transmission spans with lengths about 100km were constructed by splicing the multi-core fibres provided by different vendors. To transfer light from standard fibres to the multi-core fibre, fan-in/fan-out devices fabricated by NTT and Furukawa were used. Chiba Institute of Technology and NTT also produced pluggable connectors based on existing MU-type or SC-type interfaces. These connectors included rotational alignment features to ensure that the four cores are correctly positioned. Finally, to confirm the capacity of the multi-core transmission line, 116 wavelengths were prepared, each encoded with polarisation-multiplexed 36Gbaud 16QAM, and the signal quality was examined after 316km of transmission. An overhead of 12.75 per cent was used for error correction; thus, the effective transmission capacity was 118.5Tb/s. Satisfactory transmission quality was achieved for all cores and all wavelengths, the companies reported. Including splice losses, the maximum average loss of four cores in each span was 0.22dB/km, which is comparable to the loss of conventional singlemode fibre. “The present achievement indicates that a multi-core fibre with the standard diameter can be used to realise a transmission capacity of more than 100Tb/s while enabling the productivity improvement and effective use of the existing technology. This achievement is expected to open up earlier practical use of the multi-core fibre technology,” stated NTT.